Think you're training hard? Think again. A six-time champion natural bodybuilder teaches you how to crank it up for insane results. Intensity. In the recipe for incredible results, it's an essential ingredient. Cookies aren't sweet without sugar, and your workouts aren't worthwhile without intensity. In exercise science, intensity is defined as the amount of weight lifted for a given set. In the gym, it has a completely different meaning. Bodybuilders toss the phrase "training intensity" around like pizza-crust on high-carb day. But what is it, how do you know if you're training with enough of it, and how can you raise your current intensity level? In this article, I'll define what training intensity really means, help you determine if you're working with enough of it to achieve the results you crave, and offer simple and effective strategies that you can use for an immediate boost. Training intensity is best described as giving 100 percent of your mind, body, and soul to every repetition, every set, every exercise, and every minute of your workout. Intensity means pounding the weights so hard that all your working sets end in absolute failure: no reps uncompleted, no energy left in the tank. Intensity is as much a mental feat as it is a physical one. To train with red-line intensity, consistently push for a higher level of excellence with every exercise, set and rep, regardless of what you've achieved in the past. You must raise your standards and self-expectations each and every workout. If you want to train intensely, never be satisfied with your current level of performance. Deep down, know that you're capable of at least one more rep, five more pounds, or better execution. You have to lift harder and heavier. You want to. Remember, pain is a state of mind. When you train with this type of passion, zeal, and enthusiasm, continual performance and physique improvement are inevitable. The higher your training intensity rises, the better you'll be at initiating the muscle-building process. Here are five simple and extremely effective tips to help elevate your current intensity. Wherever you are on the workout road-beginner, intermediate or advanced-you can benefit from these techniques. I most certainly have. Just because you showed up at the gym, you can't assume you're ready to fire on all cylinders and hit the weights with full force. Don't assume you already have enough training intensity, period. In life, we acquire what we desire; we don't receive what we ignore. Therefore, you must focus and mentally commit to raising your training intensity. If you do, you'll see the physique and performance improvements you want. There is a huge difference between the two. Activity could just be showing up and going through the motions. Intensity is pouring yourself into each exercise and lifting like nothing else matters. There's no world around you, nothing but weight. Some people consistently reach the gym but don't demand enough of themselves in training. It's like they're "punching a time clock." Their consistency is admirable; their lack of focus is undesirable. When you hit the gym, it's time to punch the crap out of that time clock. Make every set count. You can build muscle effectively in two to four exercises per body part, totaling 5-10 sets. 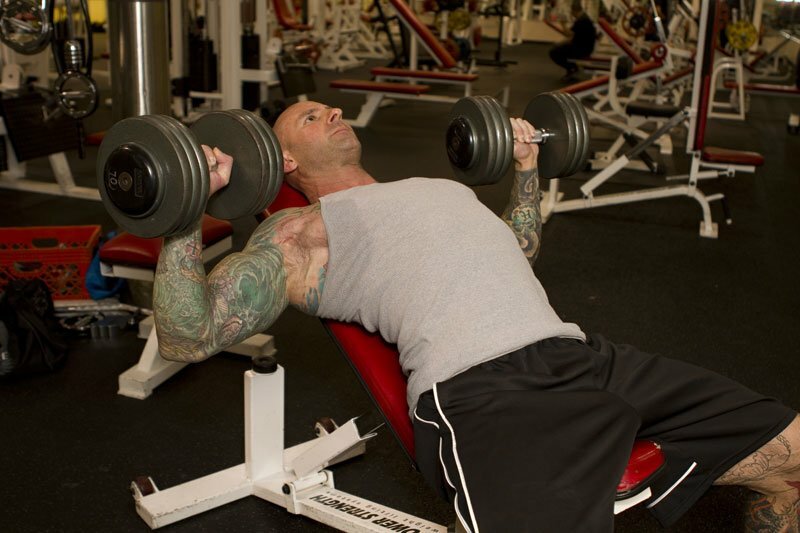 Instead of throwing on more sloppy sets, force yourself to do the job in fewer sets. The warrior inside you will make each set matter. That's when you know your training intensity is heating up. If you know you haven't worked hard enough, accept the angst and disappointment for your less-than-stellar effort—it will drive you to raise your intensity level next time. Add sets willy-nilly to your training schedule, you'll never learn this valuable lesson. Always remember that more isn't better. Better is better. Force yourself to get better-next time around. With the right level of intensity, you shouldn't have to lift longer than one hour. Lock yourself into that time frame. Regardless of how you rationalize, longer training sessions are not more productive. The longer you're in the gym, the more you will inevitably water-down your training intensity. Force yourself to become just as effective in a shorter period of time. Watch your intensity explode to new levels. It's not just a workout, it's the hour of power! This effective strategy will boost your training intensity immediately and produce better results over time. Seeing what you've done during your last training session forces you to strive for more this time. Writing down what you've done in the gym isn't just an exercise in record keeping. Review past performance before you begin each new set. That way, you'll know how to make incremental improvements. From week to week, you won't have to guess how much weight you lifted and how many repetitions you completed. Follow these strategies and you'll improve every single workout. Your physique will develop faster, you'll train smarter and harder, and your lifts will rise higher.